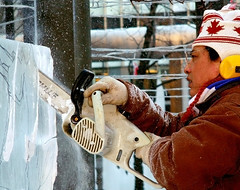 We went an saw some ice carving in Yorkville as part of Toronto’s Icefest. Some quite large sculptures were being made, there was a lifesize fireman and even a horsedrawn cart that you could sit in. I would have thought electrical equipment and melting ice weren’t a good mix but they use just about every kind of powertool (chainsaws, angle grinders, drills etc) you can think of creating these. It looks like a lot of fun, but I don’t know if its ever going to take off at home. For four days Dundas Square became a portal to Australia with the G’day Toronto Tourism Expo. In a huge tent, temperature controlled to a balmy 27 degrees, a series of events promoting Australian Tourism were held and Simon and I voluteered to help out (tickets to all the events where sold out by the time we got wind of the expo so this was the only way to get in). 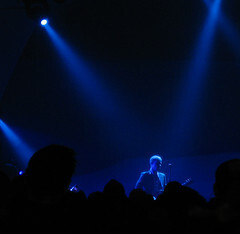 Our first event was the Silverchair and Living End concert on Thursday night. Despite being at the entrance checking in coats we got to listen to both bands and the volunteers took turns at sneaking in for a few songs. Unfortunately Simon got reassigned to the building across the street for the last couple of hours and so didn’t really enjoy the night. I also volunteerd at the Expo on Saturday, where Canadian’s had the opportunity to handle a baby croc, pat a red cattle dog, try some Penfold’s and bowl a cricket ball. To my dismay no one was selling Vegemite. Whilst there were a few highlights, we were a little disappointed with the organisation of the volunteers. We were given late notice of our shifts, breaks weren’t organised, and at times we felt like our presence was not really appreciated. I don’t think that the events company was use to managing volunteers and they had little regard for the fact that we were donating our time. Having said that we met some really nice people and were able to enjoy a little bit of home away. This morning we woke up to find that Toronto had got its first real snow storm of winter. Waiting for the bus (and streetcar) is a very different experience here in Toronto when you are 15cm deep in snow! 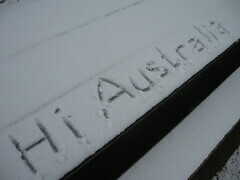 It was cold too, minus 14 degrees, brrrr. p.s. there are some pictures on Flickr. This post and the one to come next week will probably give you the impression we are getting a bit home sick. Mabye we are a little, it has been 8 months. In searching for something to do on Australia day, Gemma stumbled across the Young Australian Canadian Association webpage. While they didn’t have much to offer for Australia day, there was a competition to win two weekend passess to Ozflix, the Australian Film Festival in Toronto, which she won by simply answering what was the name of the Fighting unit in the movie Kokoda. The first thing that was apparent to me (and an elderly couple that left within 3 minutes of the first movie) was the language used in almost every movie was pretty foul. I saw Arj Barker (comedian) a year or two ago and I now know where he was comming from when he called Australia the “Swearingist country in the world”. Having not been exposed to this for a while it was a bit of a shock and while I’m sure a few Aussies would read this and with there best Alf Stewart impersonation proclaim “Stone the flamin’ crows, too right we are” or similar, based on the reactions of a few viewers I don’t think this is something we should be proud of. That aside, we saw some very interesting films ranging from ‘2:37’ a drama surounding the suicide of a school girl with a tarantinoesque mixed timeline, a series of short films about and by Aboriginies called ‘Corroboree’, another series of short documentary style films and the two crowd pullers ‘Kenny’ and ‘Boytown’. I’m not sure what press Kenny has received back home already but I couldn’t recommend this film enough. A mockumentary following the life of a lovable employee of a portable toilet business catering for Australias largest festivals. Brilliantly scripted with one liners that are sure to become common speak (‘sillier than a bum full of smarties’ or ‘Busier than a one-armed bricklayer in Baghdad’) if the film gets the airplay it deserves. Following the film we were also able to see the man himself as Kenny addressed the crowd in costume. I think many people were confused but one lady in particular could not grasp that Kenny was an actor who just delivered an incredbily believable performance. I’m sure they could easily pull off a Borat style masquerade if they wished to. Being big fans of Mick Malloys ‘Crackerjack’ we were very eager to see his latest offering ‘Boytown’. While it was entertaining it was defintely overshadowed by Kenny from the night before. Lead by Glenn Robbins, 5 aging men rekindle their former pop-star status as the original boy band, Boytown, with songs aimed at their matured audience such as ‘Stay at home Dad’, ‘Parent Teacher Night’ and ‘Cellulite Lady’. A lot of fun but I couldn’t help but think it was like The Wiggles for adults. Wait for this one to come to TV. We really enjoyed the festival, especially some of the films we had only seen in order to fill time between others and it is a great way to avoid the cold. But after about 14 hours in a cinema over 3 days don’t expect any more film reviews for a while. This morning as I turned on the news to get the snow forecast I was presented with a rodent on a log and hundreds of onlookers waiting for answers. Would it be an early spring this year? The groundhog Punxsutawney Phill says yes, on the basis that he did not see his own shadow. The Pennsylvanian groundhog also made a few statements regarding global warming, not sure why, messages about climate change seem to fall flat. Given we don’t listen to scientists proclaiming Earth’s destruction I doubt we will listen to a garden variety groundhog…although voting trends in Australia seem to suggest otherwise. Moving on, the tradition dates back to the fifth century, the European Celts believed that animals had certain supernatural powers on special days that were half-way between the Winter Solstice and Spring Equinox (Wikipedia.com). Canada has a few well known groundhogs of its own, most noted is Wiarton Willy of Wiarton, Ontario. The tradition in Wiarton is not as old, commencing in 1956 after a journalist from the Toronto Star set out for Wiarton on a tip of a Groundhog Day Festival. All he found were some locals at the bar who had decided GHD was as good excuse as any to come together for a beer. Not wanting to send the journo home empty handed one of the townsfolk stuck is wife’s fir hat in the ground, declared a prognostication and it made the front page. The following year many flocked to Wiarton to join in the festivities which continue today. Wiarton Willy is now a real albino groundhog and along with Phill he predicts an early spring. So, what of Wiarton Willy’s success rate – the locals boast a 90 – 95% success rate, the statistical data pegs Willy at 37.5%. I won’t be sending my thermals home too soon. Kew Beach GardenOriginally uploaded by simmogem. 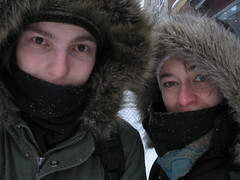 Unlike previous years, where Simon and I would spend Jan 26 in the sun counting down the Triple J’s Hottest 100 at Jess’s, this Australia Day was -17 degress and snowing. Despite this, we headed to Hemingways, a pub in the Yorkville district, where a couple of hundred other expat Aussies had gathered to enjoy a few pints and a rousing rendition of the Australian anthem. There were no meat pies and we were drinking Canadian beer but the atmosphere was great and the Aussie accents made us feel right at home. There was a lot of story telling, banter about the cricket and for a brief period Simon became a sought after commodity when it was discovered he knew most of the words to Waltzing Matilda. Hope all at home enjoyed their Australia Day. Unfortunately its not a long weekend for us, but a good night was had, followed by a lazy Saturday at home out of the snow. Contrary to our last topic of the Toronto Path, today Gemma and I ventured out into the cold to visit Scarborough Bluffs roughly 10km east of where we live on Lake Ontario. A short walk from the bus stop took us to the top of the bluffs where on a clear day you can see across the lake to the USA. Today was very much overcast, hovering just below 0 degrees C.
Here we walked across the top which has a (frozen) park and walking trail where you can see the marina and man made land formations below but we really wanted to get to the bottom where we would be able to appreciate the height off the cliffs (~65m). So we found a comparitively mild decending trail complete with icy mud where we were able to scamper down. Once down we were able to take some photos, have a wander around and catch our breath. There is some kind of water treatment at the base of the bluffs for the areas stormwater using a series of man-made inlets, filters and mangroves of some sort. By this time it was about 3pm and we were getting a little hungry (we thought there might have been somewhere for lunch at the marina but as with a lot of things it is closed over winter) so we headed off. Not being game to return the way we came we walked along the roadside up the very steep incline and I’d estimate another 3-4km’s before finding a Subway to quench our hunger pains. The manager was shocked to hear where we had walked from, probably more so by the conditions than the distance.